On Thursday, March 29, Mark A. Noll, Ph.D. presented the fourth Annual Thomas H. Lake Lecture on Faith & Giving. His lecture was titled "The Logic of Evangelicalism and the Challenges of Philanthropy." In it, Noll analyzed common threads of the Evangelical perspective on money throughout history and outlined ways in which this perspective might be broadened without losing its identity. Mark Noll's main academic concern is the interaction of Christianity and culture in 18th- and 19th-century Anglo-American societies. After many years of teaching at Wheaton College, Noll joined the history department of the University of Notre Dame as the Francis A. McAnaney Professor of History. He earned his B.A. in English at Wheaton and a Ph.D. in American religious history at Vanderbilt University. The National Endowment for the Humanities awarded him two year-long fellowships, and in 2004 he was elected a fellow of the American Academy of Arts and Sciences. 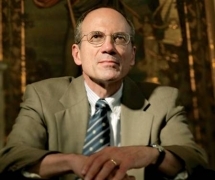 He served as the Cary and Ann Maguire Chair in American History and Ethics at the Kluge Center of the Library of Congress in 2004-05. Noll was named by Time magazine as one of the 25 most influential evangelicals in America. Among his many books, articles, and reviews, Noll's well-known titles include A History of Christianity in the United States and Canada; America's God: From Jonathan Edwards to Abraham Lincoln; The Civil War as a Theological Crisis (just published), and The Scandal of the Evangelical Mind. He co-founded The Institute for the Study of American Evangelicalism, and he is the former president of The American Society of Church History.